Queen Sugar embodies many of the elements of a real black family in the Bordelon siblings, Ralph Angel (Kofi Siriboe), Charlie (Dawn-Lyen Gardener) and Nova (Rutina Wesley)—elements that I can identify with, or thought I could until I encountered Darla (Bianca Lawson), Ralph Angel’s ex. She’s introduced in the pilot episode, when Ralph Angel calls her after his father (Glynn Turman) dies. She talks nervously about a job and wanting to see her son, Blue (Ethan Hutchison). We learn later that Darla is an ex-addict and ex-prostitute. I instantly didn’t like her, and I’m not alone: From the beginning, even Twitter was lit with doubt about her. We wait for her to flake on her responsibilities, stab the Bordelon family in the back, steal, get high. But Darla does none of this; about halfway through Season One, I figured out that Darla was an unfamiliar figure. 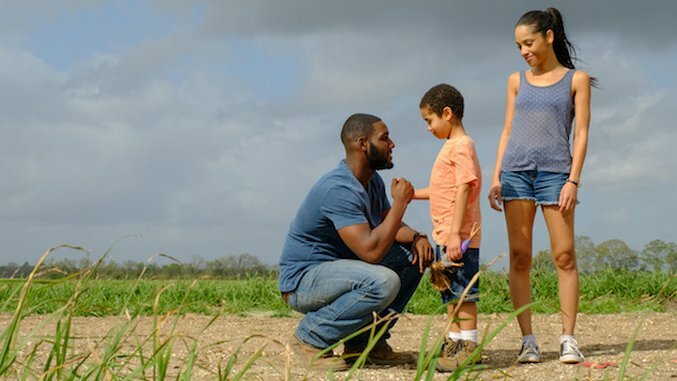 Through her, Queen Sugar upends the dangerous stereotype of the drug-addicted black mother, which not only appears in film and on TV, but also shapes the way these women are treated in the world. Darla’s arc works to restore humanity to the character, showing addiction as an illness and the addict as a human being struggling against that illness and the reputation—the stigma—she carries as a result of it. The pilot’s introduction of Darla also reveals that she and Ralph Angel are estranged, and that it’s probably her fault: By this time, we know that Ralph Angel raises Blue with the help of his Aunt Violet (Tina Lifford) and her boyfriend, Hollywood (Omar J. Dorsey). The call is probably a moment of weakness on Ralph Angel’s part, but for Darla it’s a way, finally, to prove herself. She has a new job, earning steady money and benefits. She can finally help with Blue. But for some reason, we don’t trust her. After all, the TV series that depicts the black mother as an addict usually makes her the villain: The woman is a train wreck, finding drama in everything she does. She schemes and breaks her family’s hearts, especially those of her children. She undermines the family’s success, their happiness, their very togetherness, and is often sent packing by the other characters simply to maintain stability, to prevent separation, which has always been the destruction of the black family. The type often turns up in dramas about black families. The constant plotting, the disappearances, the betrayals, the neglectful attitude toward her children are all typical moves for the drug-addicted black mom in popular culture. When we see one, we’re already predisposed to distrust her. Consider Empire, in which Cookie Lyon’s (Taraji P. Henson) sister, Carol (Tasha Smith), is a recovering addict and mom. Carol often abandons her kids with her other sister, Candace (Vivica A. Fox); she’s stolen from Cookie, brought legal trouble down upon the Lyons’ record label, and allowed an FBI agent investigating the Lyons to potentially find enough evidence enough to destroy the Lyons’ record label and send Cookie back to jail. Even in Empire’s most recent season, the series’ third, we don’t trust Carol, despite the fact that she’s gotten clean and is eager to help Cookie—always plotting herself—stop Empire’s Vegas expansion. Despite its reputation for progressive casting and storytelling, the same stereotypical traits appear in Orange is the New Black, too: Season Two’s Vee (Lorraine Toussaint), a former drug dealer, is a perfect example. Vee takes her former foster daughter, Taystee (Tasha Jefferson), under her wing once again, along with Taystee’s fellow inmates. Vee does so to manipulate them into starting a rivalry against the white and Hispanic women, where there previously was (relative) harmony. Although her addiction is to selling the drugs, not to using them, the result is the same: Her entire arc is permeated by her need to run Litchfield’s drug trade, exploit the girls who’ve become her “family,” and wreak havoc throughout the prison. Vee’s operation even convinces the inmates to reuse tampon tubes in order to smuggle cigarettes, forcing them to forgo their own dignity to help Vee turn a profit. You can never trust “mom,” in this rendering, because her selfish desires transcend the familial bond. There are other examples. In the Law & Order: Special Victims Unit episode “Dolls,” Gloria Reuben plays Violet, an ex-addict whose child is found mummified in a dumpster. (Violet is initially blamed for the death because “junkies lie all the time,” a refrain that Detective Tutuola, played by Ice-T, repeats like a broken record.) Columnist Charles M. Blow has accused Tyler Perry of building a career on the backs of stereotypical “crack mothers.” Seeing black moms who are also addicts portrayed as the villains in so many films and TV series then becomes the way we see and treat these mothers in real life. We criminalize addiction though it’s an illness. We rip mothers who are addicts from their children before offering support, making the journey to family reunification even more arduous. We accept the dearth of resources devoted to stabilizing the home environment. Distrust of addicts and ex-addicts thins out their job prospects. Add in systemic racism, which exacerbates all of the aforementioned challenges for black women, and the result is a mother doomed before she even begins recovery. This is why Queen Sugar’s Darla is so important. The series plays on the audience’s prejudice in the beginning, only to slap us in the face with it as Darla proves herself to be everything but the stereotypical addict. Darla is human, of course, struggling to right her wrongs despite the world being dead-set against her: At the outset, we see that Darla’s boss is a jackass who waves her ex-addict status over her head every time she tries to do good; she has to flake on watching Blue during Ralph Angel’s father’s funeral because the employer forces her to stay for a longer shift than promised. She can’t call because customers are honking and screaming at her to do her job. The girl is losing every way she turns. Later, when Darla shows up at the funeral, Ralph Angel tries to get up to stop her, thinking she’s up to something. Is she showing up in such a public place because she knows he can’t make a scene without disgracing the family? No. She’s just trying to make up for the earlier mess. Darla is trying to make things right. But we see this and still don’t trust her. How many Queen Sugar fans still didn’t trust Darla even after this affecting sequence, after all that we had seen in her story? I must admit that I continued to have reservations as well. It was only after the season ended—with no Darla-ignited sparks—that I had to ask myself why I didn’t trust her in the first place. The answer is that we, as viewers, have been conditioned by popular culture, in particular TV dramas, to see drug-addicted black mothers only one way, even if they’ve in recovery and are no longer under the influence. No matter how these black mothers atone, they are forever the villains. The depiction of Darla in Queen Sugar not only changes how addiction is portrayed on the small screen; the character challenges the real-life stereotype as well. In the hands of creator Ava DuVernay, Lawson, and the series’ writers and directors, Darla dismantles our impulse to prejudge and mistreat black mothers and addicts as they work to reform their lives and their families. If we can get past the stereotype to see Darla’s humanity, humility and sincerity, the same must be true of women off-screen as well—women who’ve been cast as villains for far too long. Queen Sugar airs Wednesdays at 10 p.m. on OWN. Read Paste’s episodic reviews here.